I am all about making my life easier and saving some money here and there but one thing that truly disappoints me is when I find a tip or trick on Pinterest and quickly realize it doesn’t really work. That’s enough to put me in a bad mood all day. Seriously, though I am a skeptic at heart so I am always testing things out and reading the fine print. We are all trying to make life easier on ourselves so the last thing we need is a failed science experiment on our hands. Some tips and tricks I have run across are hoax and some are over zealous people who really want it to work but they don’t tell you that it took 20 tries to make it work. I will share with you my experience and the details on what it took to make it work or why it failed. You know that one tip that says Mountain Dew will help make glow in the dark water. It’s a hoax but it’s been pinned 1000’s of times. I will be trying out different tips and tricks here through out the next few months and I will let you know if they passed or failed. I will tell you if they worked on the first try or if they turned my hair green and bleached my carpet. Anyways, I do want you to know that whatever I post is my honest opinion but as with all things you may try it and it may not work because maybe you tried the carpet gum remover tip on your 20 year old worn out gum filled carpet and I tried it on my 1 week gum stained carpet. Either way, know that when I give it a thumbs up it really did work. I will start with an awesome trick that made me do a happy dance when I discovered it and I almost cried when I realized it actually worked. I love reusing our jars but I always have trouble removing the labels. Seriously, I think they use super glue here to adhere their labels to products. I have tons of stuff to use this solution on and can’t wait to get the sticky goo off by jars. This was featured in the Simple Celebrations Mag Spring Edition here. 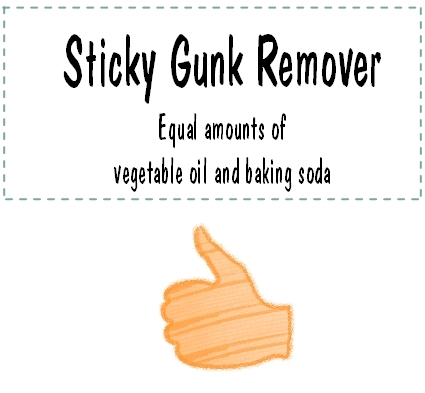 This helps remove the gunk left from labels or brands stickers on your items or jars. In a small bowl mix equal amounts of vegetable oil and baking soda and place it over the sticky gunk on your jar. It actually does works. 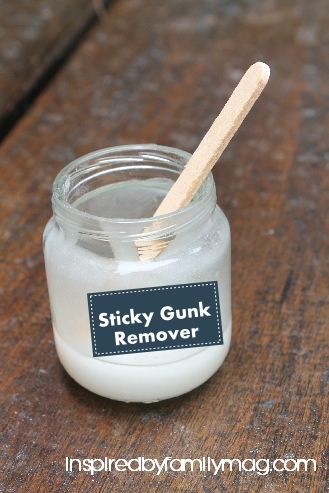 Let the solution soak into the gunk for 2-3 minutes and then rub it off with your finger or scrubbing pad. My finger worked best. I did have to add more on some spots to get it all off. I used this on my repurposed jelly jar that has been sitting in my cupboard for months now with gunk all over it. I tried using soap, soaking it with hot water…. nothing worked and I gave up. Here’s a label with the recipe so you don’t have to go hunting it down when you’re all out. This solution also gets my big fat thumbs up symbol on this trick, because it’s wicked cool! Just right-click and copy and past to your word document to print out. I put mine in a baby food jar container and I will store it in our kitchen. Having moved to a new house in the country where the stores are far and few, I have learned that baking soda is my go to for just about everything. Because everything is new, I don’t want to use harsh chemicals and seems everything is being washed with baking soda + vinegar or bs +lemon and it works better than the chemicals that are bad for the environment and expensive and don’t work anyway! I will sure try the combo of baking soda and vegetable oil. 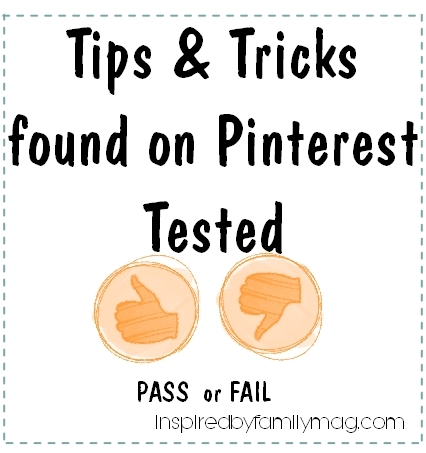 Thanks for the share…and I agree 100% with you that people pin but don’t even try therefore the results are not what you expected. This is a great idea. Do you think that it will work on skin for tape residue?